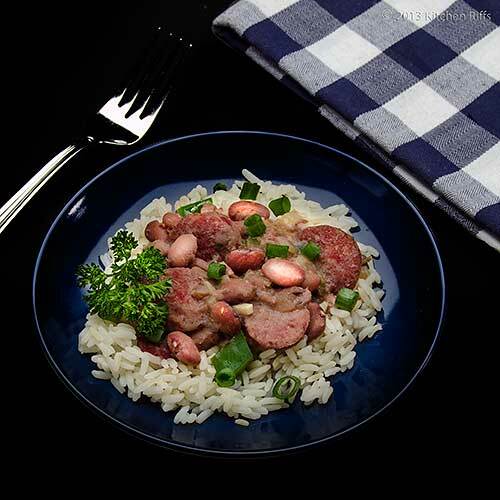 Red Beans and Rice is a traditional Creole (not Cajun) dish popular throughout Louisiana. This long-cooked comfort food used to be a staple every Monday — the day many people did their weekly laundry — because it could simmer unattended for hours, and be ready when dinnertime rolled around. Nowadays, we often associate the dish with New Orleans (where it’s available in many restaurants) and with Mardi Gras (because a batch feeds a crowd). 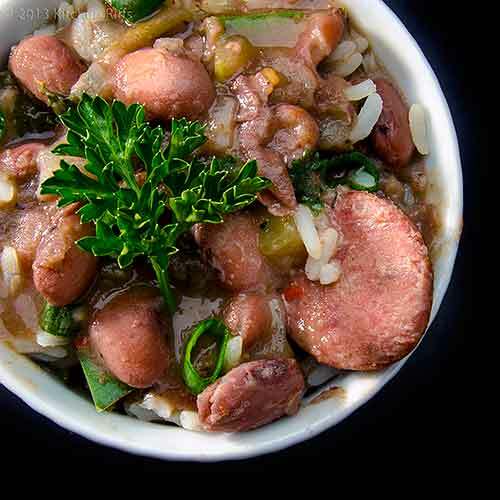 Red Beans and Rice is great any time of the year, but it’s particularly good in cold weather. So with chilly temps throughout much of the US at the moment, and Mardi Gras coming up later this week, maybe now is the time to cook some up for yourself. This dish gets its primary flavor from long-cooked beans, which achieve a smooth and creamy texture. Most people also add meat in the form of ham bone, sausage, or pickled pork. But the beans still manage to steal the show. You can prepare this dish without soaking the beans, but it will take an extra hour or two to cook. Since most of us don’t hang around the house all day, it’s usually more practical to make the dish using soaked beans. As is the case with many dishes (think chili), every family seems to have their own recipe for Red Beans and Rice. And you can find scores more in cookbooks. Mine is loosely based on one found in The 100 Greatest New Orleans Creole Recipes by Roy F. Guste, Jr. This dish takes some time to make. You need to soak the beans (the long-soak method requires at least 8 hours, while the quick soak takes a bit over an hour). Then active prep time is 20 to 30 minutes. Add another 2 hours or so for cooking time. So once you have the beans soaked and ready to go, figure close to 3 hours — most of which will be unattended cooking. This recipe feeds at least 8 people, and leftovers keep for a few days in an airtight container in the refrigerator. Or you can freeze the bean mixture (sans rice) for several months. Although there are quite a few steps to this recipe, the preparation isn't difficult. Read through the steps a time or two and you'll discover that it's a straightforward dish to prepare. Pick over beans (to remove any dirt or stones) and soak 8 hours or overnight in enough water to cover by several inches (see Notes for quick-soak method.) I usually leave the beans out on the kitchen counter overnight, but you can refrigerate them if you’re worried that they may start to ferment. About 2½ to 3 hours before you want to serve the dish, place drained beans in a large pot (one with a capacity of at least 6 quarts). Rinse ham shanks or hocks and add them to the pot. Add enough water to cover the beans by about an inch (approximately 12 cups for me), bring to simmer, and skim scum that will form. Simmer for 45 minutes to an hour (this is to develop stock). By simmer, I mean tiny bubbles are rising to the surface and breaking; we’re not talking any kind of boiling action. After the beans have been simmering for about 45 minutes to an hour (time isn’t critical for this step), cut sausage into slices about ½ inch thick (they look prettier if cut on the bias). Meanwhile, peel and cut onion into ½-inch dice; wash green bell pepper and cut into pieces about ½ inch square; wash celery, peel, and cut into dice; and wash scallions (if using) and chop into pieces about ¼ long (reserve a few of the green ends for garnish, if desired). When sausage is cooked, remove it from the skillet with a slotted spoon and add it to the beans. Reheat skillet, add additional oil if necessary (it shouldn’t be), and then add the cut-up onion, green bell pepper, celery, and scallions (if using). Sauté until the veggies turn limp and the onion begins to become translucent — 5 minutes or a bit longer. Meanwhile, peel garlic and cut into fine dice or thin pieces. Remove ham shanks (or hocks) from beans, and set aside to cool. When onion is limp, add garlic and sauté it with the vegetables for 2 minutes. Add red pepper flakes to skillet, cook for 30 seconds, and then scrape the contents of the skillet into the pot containing the beans. Add hot sauce, dried thyme, and Worcestershire sauce to the bean pot, taste, and add salt and pepper to taste. Remove meat from ham shanks or hocks, dice fine, and add to the bean pot. Cook until beans have been simmering for 2 hours (from the time you started Step 3). Meanwhile, clean and mince parsley, if using. At the 2-hour mark, stir the parsley into the bean pot. Check the beans — if they’re soft and creamy, the dish is ready to go. Otherwise, continue cooking a bit longer. Just before serving, you may want to mash up some beans (or whirl with a hand-held blender for a few seconds; see Notes) to break down some of the beans and thicken the sauce a bit. Adjust seasoning, and serve the beans over cooked rice. Garnish each serving with some chopped parsley or minced green tips from scallions, if desired. I always have a bottle of Tabasco on the table for those who want their beans to be a bit hotter. You can also make this dish without soaking beans: Just pick through the beans, then rinse. Then follow the recipe beginning with Step 2, but add at least an extra hour (and usually more like an hour and a half) cooking time in Step 3. This dish is traditionally made with ham bone, but most of us don’t have these on hand. Ham shanks or hocks (the shanks have more meat) are a good substitute, and make a nice broth. If you want a stronger flavored broth, you can add a bit of ham base to the pot. Ham base is concentrated stock in paste form, and is sold in jars in the soup section of many supermarkets (I particularly like the Better than Bouillon brand, but there are other good ones out there). 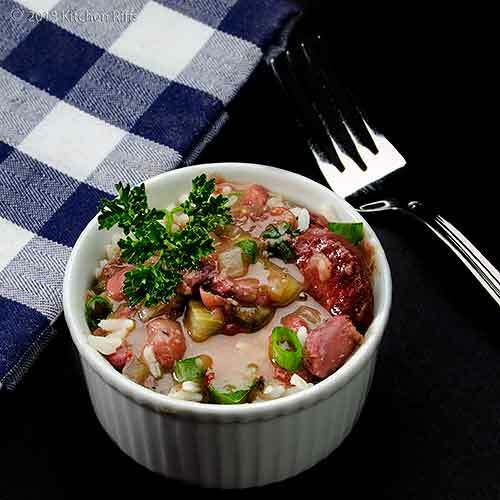 Some Red Beans and Rice recipes call for tasso, a spicy ham-like smoked meat that is made from pork shoulder (ham is always made from the pork hind leg, but the flavor of the two is identical). Typically, you sauté it along with the onions, green pepper, and celery. Many versions of this dish call for sausage. Andouille is the traditional choice. This is a spicy sausage flavored with garlic. It’s always made with pork, although I’ve seen some good ones that also use a bit of beef. Look for a locally made one; I haven’t seen any sold by a national brand that are worth buying. If you can’t find a decent andouille, look for a smoked sausage, preferably one that’s spicy. Kielbasa often makes a good substitute. 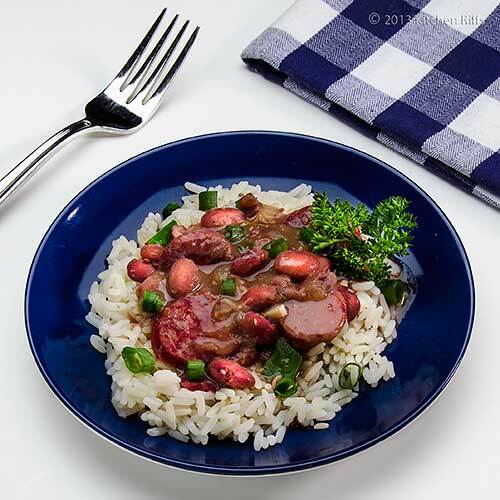 Many people from Louisiana say that Red Beans and Rice isn’t the “real thing” unless it contains pickled pork (pork that is brined in vinegar and seasonings). You can buy this at the supermarket in some (though not most) parts of the country, or you can make your own (there are loads of recipes on the internet; Google is your friend here). If you use a stick blender to break down your beans a bit (Step 15), use one with a metal shaft. Be aware that if your stick blender has a plastic shaft, the hot liquid may crack it. Ask me how I know. When it comes to food, Cajun tends to be more rustic, while Creole generally is more European-influenced. Creole dishes are quite common in New Orleans restaurants. Both cuisines are good stuff. Bring on Mardi Gras — and Other Festivities! There’s a lot going on this week. Chinese New Year begins today, February 10th (it’s the year of the snake). Valentine’s Day is Thursday, the 14th. And the 12th is Shrove Tuesday — Mardi Gras — which means that Ash Wednesday marks the beginning of Lent (and for many people, a 40-day period of abstaining from rich food). Traditionally on Mardi Gras (which means “Fat Tuesday” in French), people use up all the fat in the house in preparation for the fast to come. So many people make doughnuts, Pancakes, and all sorts of other fatty foods. Mardi Gras is also a big party time, especially in New Orleans, but in many other places as well. There are big doings — including parades and such — in a lot of communities (St. Louis, where I live, has a celebration that isn’t quite in the same league as the one in New Orleans, but is pretty raucous and festive nonetheless). If you don’t fancy pancakes or doughnuts for your Mardi Gras feast, Red Beans and Rice would be perfect. If you want a similar dish that pays homage to Chinese New Year, you might consider making Red-Braised Beans and Sweet Potatoes or Red-Braised Beef with Sweet Potatoes. The former is a vegetarian dish; add beans to the latter (along with the beef, or substitute pork), and you have a meat-and-beans dish that will please anyone. Any way you look at it, the next week or so is chockfull of celebrations. So, as they say in New Orleans, laissez les bons temps rouler (let the good times roll). Love comfort food like this. Hi Anne, the aroma from this simmering definitely will drive you crazy! Such good stuff! This is an easy dish to make, once you get into it - you'll really enjoy it. Thanks for your comment. Hi Alex, isn't this a great dish? Thanks for your comment. Oh my ... I love red beans and rice! And while this dish is a lot of work, it truly is worth it! Fabulous recipe again! Hi Kimberly, isn't this such a fantastic dish? Tons of flavor. The dish basically cooks itself, which takes all the time. The rest of the work isn't too bad, and definitely worth doing to get the great eating. ;-) Thanks for your comment. My husband's mother grew up outside New Orleans. We love red beans and rice and this is definitely the time of year to make it. And I am so ready to get the good times rollin'! Hi Abbe, I just love this dish! Some of the best I've ever had was in New Orleans at Buster Holmes Restaurant. Good stuff. ;-) Thanks for your comment. I love that you use dried beans and soak them yourself. So many people buy the canned variety, but I think soaking my own makes for better beans with a lovelier texture. This dish looks like comfort food at its best! Hi Uru, this is indeed a hearty dish! Great not only for Mardi Gras, but chilly weather. Thanks for the comment. Hi Kristi, this dish never seems right when made with canned beans. I do used canned for some things, but you're right that dried beans have a much better texture. Thanks for the comment. This is a great dish, John. Love that you use both sausage and ham hocks in it. I usually use smoked hocks in my dishes but I've not a good recipe for red beans & rice. Guess whose recipe I'll be preparing next time? This one is too good to pass up, especially being that it can be easily frozen. I just need to clear some of the other food that was easily frozen to make room for the beans and rice that are sure to come that way. Thanks for a great recipe and post, John. I love everything about this dish. I am a big fan of beans. Sounds delicious. There IS a lot going on next week! We tend to celebrate Mardi Gras more than Valentine's Day! :) Won't be cooking red beans, but you'll see soon what I did cook up. Even after having lived in Louisiana for 18 years, I had never heard Mardi Gras called Shrove Tuesday, but then I was raised Southern Baptist and MG is actually more of a Catholic holiday. We always called it Fat Tuesday because everyone pigged out before lent started on Ash Wednesday. :) Red beans and rice is one of those dishes that Bobby likes to make. He started making it in his college days, so when he wants them, the kitchen is all his. Smoked ham hocks and andouille - definitely! The rest of your recipe looks very similar to his with some slight differences, so I know that the bowl of beans I'm seeing here is delicious!!! Great post, great recipe!! Laissez Les Bon Temps Roulez! Good story about the washing day but I am one of those people who stay well away from beans. Too many bad experiences. Nice tip about the stick blender. Hi John, this is a really good recipe. And the better your sausage, the better your final result! I've got the same problem you do - too much stuff in the freezer! Thanks for the comment. Hi Dawn, it is delicious, it is! ;-) Truly good stuff. Thanks for your comment. Hi MJ, we celebrate all holidays in the Kitchen Riffs household! We don't observe a Lenten fast, but we always pig out on Fat Tuesday too, just because. ;-) Looking forward to reading about what you cooked up! Thanks for the comment. Hi Zoe, I use canned beans sometimes, too, but the dried ones are really better. Lately I've been making big batches of beans and then freezing them - that works pretty well in most recipes. Thanks for the comment. Hi Suzanne, beans don't agree with everyone, so since you know that, you're wise to give them a wide berth! Thanks for the comment. What a beautiful and flavorful dish. I love Creole recipes. I was in New Orleans a few months ago and felt in love with the food and the city. Can't wait to try this out. Great recipe to put into my 'autumn' file here Down Under. Have not made it for ages! Remembering I'm just an 'ignorant' Aussie would you define the difference twixt 'Cajun' and 'Creole' for me. When I first attempted Louisiana food many years ago I had a Times-Life 'bible' 'Cajun and Acadian cooking' with which I have since sadly parted ways. 'Creole' to me is French/US 'local' but so is 'Cajun' kind'of and some of my US friends do use the two interchangably!!! What a tasty dish! Rice and beans is one of my fave meals but I love the spicy sausage in this recipe. Delicious!! Beautiful dish and I love the way you broke down the traditions! What a great recipe, thanks again for such an informative post. Hi Amy, isn't New Orleans a fabulous food city? It's hard to have a bad meal there. Thanks for the comment. Hi Eha, I do talk a bit about the difference between Cajun and Creole food in the Notes (the last two entries). But a lot of people do use them interchangeably! And the flavors are often so similar that it's hard not to. Basically Creole is more oriented towards European methods while Cajun is more down home cooking, but there are lots of exceptions to this. Thanks for the comment. Hi Natalie, spicy sausages are so good, aren't they? You can make this dish without them (many do! ), but I really like including them. Thanks for the comment. Hi Alyssa, it tastes much, much better than it looks! Thanks for the comment. Hi Lizzie, it's a real favorite of mine. Thanks for the comment. This looks like the perfect comfort food and very flavoursome! John, this looks delicious. I have never prepared red beans and rice and love both. I would enjoy this with the kielbasa. Looks delicious! I wish you and Mrs. Riff a Happy Valentine Week! We use red beans cooked with rice in Korea. I love the purple color it brings and the flavor. Not only mixed in rice, we make porridge with red bean, too and it is simply delicious. Red beans are often used in dessert as well. My favorite has to be shaved ice with simmered sweet red bean sauce and sweetened milk. Thanks for all the great detail that goes in the dish. I always learn a lot from your site. I'm a big fan of Creole/Cajun cuisine...it's difficult to find here unless we cook it ourselves, but we certainly ate our fair share when we were in New Orleans and Alabama. This week is definitely a big week, for sure! I had forgotten all about Pancake Day tomorrow, but now that I've been reminded, I may just have to have pancakes for breakfast! Perfect recipe to get everyone in the Mardi Gras spirit if they can't make it to New Orleans. Hi Christine, it's really quite nice! And it is great comfort food. Thanks for the comment. Hi Charlie, this is totally great comfort food! Might be too warm for you to enjoy it now, but when chilly weather comes, this will be very welcome. Thanks for the comment. Hi Judy, this is one of those classic dishes that once you make it, you'll be wondering where it's been all your life. Kielbasa works quite well in this. Happy Valentine Week to you, and thanks for commenting. Hi Holly, I think much of the world uses some form of red bean! I love the idea of red bean porridge - sounds wonderful. Thanks for your comment. Hi Ali, Creole and Cajun food isn't all that easy to find in many parts of the US, so learning to make your own is always a great option no matter where you live. Or you can always fly to New Orleans. ;-) Enjoy your pancakes tomorrow, and thanks for the comment. Hi Karen, New Orleans is of course the best place to be for Mardi Gras, although it's crowded crowded crowded! St. Louis actually has a wonderful Mardi Gras celebration - probably second only to New Orleans in the US. And this dish is perfect for the day no matter where you live. ;-) Thanks for the comment. Hi Kathy, thanks so much for your kind invitation, and for commenting. Oh, this looks absolutely amazing ! Hi Sketched Chef, isn't this kind of food great? So satisfying, particularly when the weather is cold. Thanks for the comment. I love, love, love red beans and rice - it's one of my favorite dishes. Your version looks delish, I like the use of Worcestershire for a bit of added depth. Hi Food Jaunts, the Worcestershire sauce really adds a nice bass note to the dish. It's subtle, but there. Thanks for the comment. Hi Luci, it really is a wonderful and tasty dish! Thanks for the comment. I just love slow-cooked dishes like this one, it really brings out the flavor! Hi Kristi, I agree that dishes like this are wonderful! And this one is particularly good. ;-) Thanks for the comment. We definitely tried this dish when we were in New Orleans--I'm excited to give it a try because there were quite a few places that made it better than the others. I bet this one will turn out just swell! I miss NOLA already. Hi Ala, this is a pretty good dish! Do make sure you get decent sausage (if you use it) - that can make a big difference. Thanks for the comment. I missed the boat again...I thought briefly about doing a dish for Mardi Gras, but got distracted by Valentine's Day (and the start of Lent). Maybe I'll be on the ball by next year, but until then I'll dream about your wonderful red beans and rice (which I've never tried before...hmmm...need to fix that!). Hi Lizzy, there are so many holidays this week! Impossible to have an appropriate post for them all. And if you've never tried red beans & rice, you definitely do need to remedy that! Thanks for the comment. This dish looks really appetizing. Almost like a "German Eintopf" (hearty soup). Although I have never celebrated Mardi Gras here in the US I have celebrated it throughout my childhood in Germany where we call it Carnival. The Carnival finishes on Ash Wednesday and the season of lent begins the same way as you had described it. Aren't Culinary Traditions wonderful? Beautiful post. Hi Frank, culinary traditions are indeed wonderful! I believe many countries use the name Carnival instead of Mardi Gras. Same thing, though. ;-) And this is a really hearty dish, so it certainly sounds similar to an Eintopf. Thanks for your comment. I love red beans and rice. It's amazing how two very humble ingredients can combine to become something so very special. It's total comfort -- like a big hug in a bowl. Hi Carolyn, this dish is indeed a big hug in a bowl! Great phrase. Thanks for the comment. I'm new to this dish. I've had Creole dish once (in SF) but I have to say I'm not familiar with the cuisine much. Sounds very interesting and comforting. Would love to taste this. A fantastic combination. This dish must be really comforting, nurishing and enjoyable. Perfect winter food. Hi Nami, if you ever have a chance to visit New Orleans, you'll be able to sample tons and tons of Creole food. But most people in the US aren't really that familiar with Creole (or Cajun) either, except for this dish, and probably gumbo and jambalaya. Thanks for the comment. Hi Rosa, it's wonderful winter food! Although not a dish I have all the time, one that's fun once or twice a year. Thanks for the comment. One of my colleagues grew up in New Orleans and he always raves about the Southern comfort food he grew up eating. The red beans and rice is one of the many dishes I've learned about from him. Now I have a wonderful recipe I have to try it out. Thanks for sharing! I could eat stuff like this for breakfast lunch and dinner! It looks fantastic! Hi Yi, this is really a dish that's worth making. Great flavor, and very filling. Thanks for the comment. Hi Chris, I've never had it for breakfast, but I could eat it then too! Such good stuff. Thanks for the comment. Oh my, that rice dish must be so flavour packed! Hi Raymund, this is a dish I think you'd really like - tons of flavor! Thanks for the comment. Hi Terra, you're right that this is a pretty meaty version. I also make a version with almost no meat, but I do love the flavor of andouille in this. ;-) Thanks for your comment. I've never had anything like this, but sounds really good, especially making more and eating the next couple of days. Hi Ali, fortunately making Creole or Cajun at home isn't too hard. A few ingredients might be hard to find like andouille sausage (but you can make your own), tasso (which many recipe don't call for), or filé powder for gumbo (although some people don't use it, and substitute okra). But otherwise almost everything else is just straight good home cooking. Learning to make a long-cooked roux (cooking it a good 45 minutes so it become nutty brown) might be the hardest challenge, and you can actually make a big batch of that at one time, portion it out, and freeze it. Have fun experimenting! Hi Gourmantine, this is so good - totally worth making, IMO. And this recipe does make quite a bit, and although you can cut it down, it freezes beautifully, so I always make the whole thing even though there are only two of us. It tastes better as it ages! Thanks for the comment. This is just one of those dishes I've never made for some unknown reason. I need to try this. It looks fantastic. Hi Kim, this recipe is super good, and great for cold weather - something you know a little bit about. Thanks for the comment. This was a great recipe for a very flavorful red beans and rice. Thanks for sharing! Hi Amanda, it's really nice, isn't it? So delish! Thanks for the comment.